On July 20, 2012, a mass shooting occurred inside a Century 16 movie theater in Aurora, Colorado, during a midnight screening of the film The Dark Knight Rises. Dressed in tactical clothing, James Eagan Holmes set off tear gas grenades and shot into the audience with multiple firearms. Twelve people were killed and seventy others were injured, 58 of them from gunfire. At the time, the attack had the largest number of casualties in one shooting in modern U.S. history, until the Orlando nightclub shooting in 2016 and the Las Vegas shooting in 2017. It was the deadliest shooting in Colorado since the Columbine High School massacre in 1999. Holmes was arrested in his car outside the cinema minutes later. Earlier he had rigged his apartment with homemade explosives and incendiary devices, which were defused by the Arapahoe County Sheriff's Office Bomb Squad a day after the shooting. The shooting prompted an increase in security at movie theaters across the U.S. that were screening the same film, in fear of copycat crimes. It led to a spike in gun sales in Colorado and political debates about gun control in the United States. Holmes confessed to the shooting but pleaded not guilty by reason of insanity. Arapahoe County prosecutors sought the death penalty for Holmes. The trial began on April 27, 2015. On July 16, he was convicted of 24 counts of first-degree murder, 140 counts of attempted first-degree murder, and one count of possessing explosives. On August 7, he was sentenced to life in prison without the possibility of parole. On August 26, he was given twelve life sentences, one for every person he killed; he also received 3,318 years for the attempted murders of those he wounded and for rigging his apartment with explosives. 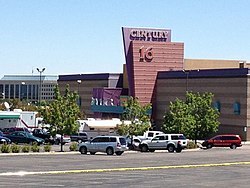 The shooting occurred in Theater 9 at the Century 16 multiplex (operated by Cinemark), located at the Town Center at Aurora shopping mall at 14300 E. Alameda Avenue. Police said Holmes bought a ticket, entered the theater, and sat in the front row. About 20 minutes into the film, he left theater 9 through an emergency exit door beside the movie screen, with direct access to the lightly used parking area at the back of the complex, while propping the door slightly open with a plastic tablecloth holder. There were about 400 people inside theater 9. Holmes then went to his car, which was parked near the exit door, changed into protective clothing, and retrieved his guns. About 30 minutes into the movie, police say, around 12:30 a.m., he reentered the theater through the exit door. He was dressed in black and wore a gas mask, a load-bearing vest (not to be confused with a bulletproof vest), a ballistic helmet, bullet-resistant leggings, a bullet-resistant throat protector, a groin protector, and tactical gloves. He was also listening to techno music through a set of headphones so the reactions in the theater could not be heard. Initially, few in the audience considered Holmes to be a threat. According to witnesses, he appeared to be wearing a costume, like other audience members who had dressed up for the screening. Some believed he was playing a prank, while others thought he was part of a special effects installation setup for the film's premiere or a publicity stunt by the studio or theater management. It was reported that Holmes threw two canisters emitting a gas or smoke, partially obscuring the audience members' vision, making their throats and skin itch, and causing eye irritation. He then fired a 12-gauge Remington 870 Express Tactical shotgun, first at the ceiling and then at the audience. He also fired a Smith & Wesson M&P15 semi-automatic rifle with a 100-round drum magazine, which eventually malfunctioned. Finally, he fired a .40-caliber Glock 22 Gen4 handgun. He shot first to the back of the room, and then toward people in the aisles. A bullet passed through the wall and hit three people in the adjacent theater 8, which was screening the same film. Witnesses said the multiplex's fire alarm system began sounding soon after the attack began and staff told people in Theater 8 to evacuate. One witness said she was hesitant to leave because someone yelled that someone was shooting in the lobby. Holmes fired 76 shots in the theater: six from the shotgun, 65 from the semi-automatic rifle, and five from the .40-caliber handgun. The first phone calls to emergency services via 9-1-1 were made at 12:39 a.m. Police arrived within 90 seconds and found three .40-caliber handgun magazines, a shotgun, and a large drum magazine on the floor of the theater. Some people reported the shooting via Twitter or text messaging rather than calling the police; officers were already at the theater by the time that tweets had been sent. Ambulances were hindered by chaos and congestion in the parking lot, and they were unable to reach the back side of the complex where police had pulled the injured out the emergency exit doors of Theatre 9. By then, Sgt. Stephen Redfearn, one of the first police officers who arrived on the scene, sent victims to area hospitals in squad cars. About 12:45 a.m., police officer Jason Oviatt apprehended Holmes behind the cinema, next to his car, without resistance. He was initially mistaken for another police officer because of the tactical clothing that he was wearing. He was described as being calm and "disconnected" during his arrest. According to two federal officials, Holmes had dyed his hair red and called himself "the Joker", although authorities later declined to confirm this. Three days later, at his first court appearance in Centennial, Colorado, Holmes now had reddish-orange hair. The officers found several firearms in the theater and inside the shooter's car, including another Glock 22 handgun. Holmes was also carrying a first aid kit and spike strips, which he later admitted in an interview he planned to use if police either shot at or chased him. Following his arrest, Holmes was initially jailed at the Arapahoe County Detention Center, under suicide watch. The police interviewed over 200 witnesses of the shooting. Speaking on behalf of himself and FBI agent James Yacone, who was in charge of the investigation, Aurora Police Chief Dan Oates said he was confident that the shooter acted alone. A view of the multi-jurisdictional effort to clear the shooter's apartment of booby traps. The corner of his apartment building is visible between the white van and the fire truck. Note the white-painted bomb-disposal trailer. When apprehended, Holmes told the police that he had booby trapped his apartment with explosive devices before heading off to the movie theater. Police then evacuated five buildings surrounding his Aurora residence, about 8 km (5 mi) north of the cinema. Holmes' apartment complex is limited to University of Colorado Medical Center students, patients, and employees. One day after the shooting, officials disarmed an explosive device that was wired to the apartment's front door, allowing a remote-controlled robot to enter and disable other explosives. The apartment held over 30 homemade grenades, wired to a control box in the kitchen and filled with at least 110 L (30 US gal) of gasoline. Neighbors reported loud music from the apartment around midnight on the night of the massacre, and one went to his door to tell him she was calling the police; she said the door seemed to be unlocked, but she chose not to open it. A police official said a Batman mask was found in the apartment as well. On July 23, police finished collecting evidence from the apartment. Two days later, residents were allowed to return to the four surrounding buildings, and six days later, residents were allowed to move back into the formerly booby-trapped building. Eighty-two casualties were reported. Seventy were hit by bullets, reported by mainstream news as the most victims of any mass shooting in United States history. This figure would not be surpassed until the 2016 Orlando nightclub shooting, which killed 49 people and injured 58 others for a combined total of 107 casualties. Four people's eyes were irritated by the tear gas grenades, while eight others sustained non-gunshot injuries while fleeing the theater. The massacre was the deadliest shooting in Colorado since the Columbine High School massacre on April 20, 1999. The injured were treated at Children's Hospital Colorado, Denver Health Medical Center, The Medical Center of Aurora, Parker Adventist Hospital, Rose Medical Center, Swedish Hospital, and University Hospital. On July 25, three of the five hospitals treating victims announced they would limit medical bills or forgive them entirely. Ashley Moser, Veronica Moser-Sullivan's mother, suffered critical injuries after being shot in the chest and was rendered a paraplegic. She miscarried a week after the attack. Caleb Medley, the last victim discharged, left University Hospital on September 12. He had serious brain damage and an injury to his right eye from a shotgun blast to the head, and underwent three brain surgeries. He required a feeding tube, had severely impaired movement, and could no longer speak. The Community First Foundation collected more than $5 million for a fund for victims and their families. In September, victims and their families received surveys asking about their preferences for how collected funds should be distributed, either by dividing it equally among victims or through a needs-assessment process. On November 16, 2012, the Aurora Victim Relief Fund announced that each claimant would receive $220,000. Holmes' booking photo was released and he first appeared in court on July 23, 2012. According to press reports, he seemed dazed and largely unaware of his surroundings. On July 30, Colorado prosecutors filed formal charges against Holmes, including 24 counts of first degree murder, 116 counts of attempted first degree murder and one count of illegal possession of explosives. Two charges were filed for each victim to expand the opportunities for prosecutors to obtain convictions. Colorado State District Court Judge William B. Sylvester, who is the trial judge overseeing the case, has placed a gag order on lawyers and law enforcement, sealing the court file and barring the University of Colorado from releasing public records relating to Holmes' year at the school. Media organizations are challenging the sealing of the court file. On August 9, Holmes' attorneys said he is mentally ill and they needed more time to assess the nature of his illness. The disclosure was made at a court hearing in Centennial, Colorado, where news media organizations asked a judge to unseal court documents in the case. Prosecutors alleged on August 24, 2012, that Holmes told a classmate he wanted to kill people four months before the shooting. A judge ruled on August 30 that a notebook written by Holmes, in which he allegedly described a violent attack, was covered by physician–patient privilege, because it was addressed to his psychiatrist. This made it inadmissible as evidence unless Holmes' mental health became an issue in the case. Prosecutors dropped their request for access to the notebook on September 20, 2012. Due to suicide attempts made by Holmes, Judge Sylvester agreed to postpone proceedings until December 2012. Also on January 7, lawyers for both sides argued whether to admit four unspecified prescription bottles and immunization records investigators had seized from Holmes' apartment when they searched it in July 2012, considering doctor-patient confidentiality laws. The judge ruled in October that prosecutors could keep the items. On March 27, Holmes' lawyers offered a guilty plea in exchange for prosecutors not seeking the death penalty. On April 1, the prosecution announced it had declined the offer. Arapahoe County district attorney George Brauchler said "It's my determination and my intention that in this case for James Eagan Holmes justice is death." On February 10, 2014, the presiding Arapahoe County District Court Judge, Carlos Samour, denied the last of the defense's motions to keep evidence from trial. Jurors were permitted to hear about evidence found in Holmes' computers through disputed warrants and his illegally obtained credit union records. The trial, originally set for February 2014, was placed on hold while Judge Samour decided whether Holmes, who pleaded not guilty by reason of insanity, should undergo a second psychiatric evaluation. Jury selection started on January 20, 2015. It ended on April 15, 2015. The trial started on April 27, 2015. The jury consisted of nineteen women and five men, two of whom had connections to the Columbine High School massacre. Arapahoe County prosecutors say Holmes was sane during the shooting and aimed to kill all 400 people in the theater, while Holmes' lawyers said he had a psychotic episode during the attack. On May 7, an FBI agent displayed pieces of evidence at the trial, including Holmes' body armor, arsenal of weapons, unfired ammunition, and helmet with strands of his dyed orange hair. Jurors examined the evidence for thirty minutes. Holmes was represented by the Colorado State Public Defender. On May 26, details of Holmes' notebook, reportedly found in a university mail room addressed to his psychiatrist Lynne Fenton, were entered into evidence at the trial for the first time. The notebook elaborated on Holmes' obsession to kill since ten years prior to the shooting and his dissatisfaction with life and finding work, as well as health issues. It also had details of planning for the shooting, which prosecutors said indicated Holmes premeditated the attack. On May 27, Dr. William Reid, a court-appointed psychiatrist, testified that Holmes was mentally ill but legally sane. Reid and another doctor evaluated Holmes in December 2013 and determined that he understood what he was doing. On June 8, a second psychiatrist, Jeffrey Metzner, testified that Holmes was mentally ill but legally sane during the shooting, and suffers from schizoaffective disorder. On June 9, three jurors were dismissed from the trial due to concerns of them violating orders not to talk about news reports about the case. In the following week, this was followed by two additional jurors; the first was dismissed due to emotional problems in the wake of the shooting of a family member, the second for recognizing a survivor who was wounded in the massacre. On July 9, Judge Carlos Samour asked Holmes if he would testify in court, and advised him of his rights to do so. Holmes chose not to testify. By July 10, the prosecution and the defense rested their cases. Closing statements were made on July 14, with formal deliberations beginning the following morning. On July 16, after jury deliberations, Holmes was found guilty of twenty-four counts of first-degree murder, 140 counts of attempted first-degree murder, one count of possessing illegal explosives, and a sentence enhancement of a crime of violence. The two murder convictions for each death were first-degree murder or attempted murder after deliberation, and first-degree murder or attempted murder with extreme indifference. The sentencing phase began on July 22. On July 23, the jury ruled that Holmes acted in a cruel manner, was lying in wait, and ambushed his victims during the shooting, which constitute as aggravating factors. However, the jurors decided that Holmes did not intend to kill children when he opened fire. On July 27, Holmes' sister stated in her testimony that her brother became withdrawn from the family after they moved from Salinas to San Diego during his early teenage years. On July 28, Holmes' father pleaded for his son's life, stating that he is severely mentally ill. He displayed photos of camping trips and family vacations with Holmes to the jury. On July 30, Holmes' lawyers made a final appeal to the jurors, urging them to consider mental illness in his sentencing despite their rejection of the insanity defense used in the trial. The appeal for clemency was rejected on August 3 under the basis that mitigating factors such as mental illness did not outweigh aggravating factors such as the number of casualties in the massacre. Holmes was sentenced to life in prison without the possibility of parole on August 7 after jurors failed to reach a unanimous decision over sentencing him to death. Formal sentencing began on August 24 and was expected to last for three days. At the end of the hearing on August 26, Samour formally sentenced Holmes to twelve life imprisonment sentences without parole and a maximum 3,318 additional years on attempted murder and explosives possession convictions. The evening after the shooting, a candlelight vigil was held at the site in Aurora. President Barack Obama ordered flags at government buildings flown at half-staff, in tribute to the victims, until July 25. Both Obama's and Mitt Romney's campaigns temporarily suspended television advertising in Colorado for the 2012 presidential election. On July 22, President Obama met with victims and local and state officials and gave a nationally televised speech from Aurora. Many world leaders sent their condolences, including Queen Elizabeth II, French President François Hollande, Israeli Prime Minister Benjamin Netanyahu, Russian President Vladimir Putin, and Pope Benedict XVI. I would not presume to know anything about the victims of the shooting but that they were there last night to watch a movie. I believe movies are one of the great American art forms and the shared experience of watching a story unfold on screen is an important and joyful pastime. The movie theatre is my home, and the idea that someone would violate that innocent and hopeful place in such an unbearably savage way is devastating to me. Nothing any of us can say could ever adequately express our feelings for the innocent victims of this appalling crime, but our thoughts are with them and their families. Warner Bros., the distributor of The Dark Knight Rises, said it was deeply saddened by the shooting. The studio canceled the film's gala premieres in France, Mexico, and Japan, scaled down its marketing campaign in Finland, and decided not to report box office figures for the movie until July 23. Some television advertisements for the film were also canceled. Other major film studios joined Warner Bros. in withholding early box office numbers on July 21. Warner Bros. reportedly made a "substantial" donation to Colorado's Community First Foundation to benefit victims. Christopher Nolan, the film's director, spoke on behalf of his cast and crew and called the event "savage" and "devastating." Christian Bale, who plays Batman in the film series, privately visited victims on July 24. Members of the Colorado Rockies baseball team also visited victims. Members of the Denver Broncos also called or visited individuals at the hospitals. Warner Bros. instructed cinemas to stop screening a trailer for the film Gangster Squad, which preceded The Dark Knight Rises screenings in some cities (though not in Aurora), because it contained a scene involving the main characters shooting at a movie theater audience with machine guns. The film's release date was rescheduled to January 2013, and the theater scene was replaced by a new sequence in a different setting. In the wake of the shooting, DC Comics delayed the release of Batman Incorporated #3, which includes a scene in which a female Leviathan agent brandishes a handgun in a classroom full of children while disguised as a schoolteacher. Warner Bros. Animation reportedly edited the Cartoon Network series Beware the Batman to make the firearms look less realistic. Hans Zimmer, who composed the soundtrack for The Dark Knight Rises, recorded a choral song entitled "Aurora" in honor of the victims. The song was sold for donations that went to a fund for the victims. Cinemark agreed to pay any funeral expenses incurred by the deceased victims' families not covered by the Crime Victims' Compensation Fund. Cinemark closed the entire Century Aurora 16 multiplex in the wake of the shooting but reopened January 17, 2013 with a 40-minute ceremony led by Aurora Mayor Steve Hogan. As of April 2, 2015, Cinemark Theatres has not released any photographs or video evidence. Soon after the shooting, police departments and cinemas across the United States and around the world increased security for fear of copycat incidents. In New York City, police officers were deployed to theaters screening the new film. The National Association of Theatre Owners distributed checklists from the U.S. Department of Homeland Security to its members and said in a July 21 statement that members were "working closely with local law enforcement agencies and reviewing security procedures." AMC Theatres announced it would "not allow any guests into our theatres in costumes that make other guests feel uncomfortable and we will not permit face-covering masks or fake weapons inside our buildings." Security Director News raised the possibility in a July 23 article that "the massacre could be a Virginia Tech for movie theaters, causing security to become a bigger part of the conversation and more stringent security procedures to be adopted at theaters across the country." Several theaters subsequently held tighter security on allowing unaccompanied singles to see films. Three victims sued Cinemark Theatres in the U.S. District Court for the District of Colorado on September 21, 2012 for the company's alleged negligence in failing to provide adequate safety and security measures. Their attorneys released the statement "Readily available security procedures, security equipment and security personnel would likely have prevented or deterred the gunman from accomplishing his planned assault on the theater's patrons." In response, Cinemark's representation filed a motion to dismiss on September 27, 2012, on the grounds that there was no liability under Colorado law for failure to prevent an unforeseeable criminal act. Cinemark's motion quoted extensively from the landmark California appellate opinion that held McDonald's had no duty of care to prevent the 1984 San Ysidro McDonald's massacre. On October 30, 2012, the court hearing the criminal case against Holmes denied a motion by some of the survivors that would have let them access sealed evidence for review in their civil action against the theater chain. On January 24, 2013, U.S. Magistrate Judge Michael Hegarty issued a recommendation that most of the claims be thrown out, as they were not allowable under Colorado law. He also said claims alleging violations of the Colorado Premises Liability Act could proceed. Judge R. Brooke Jackson stated that for theaters today, "One might reasonably believe that a mass shooting incident in a theater was likely enough (that is, not just a possibility) to be a foreseeable next step in the history of such acts by deranged individuals". Attorney Christina Habas, who represents several theater victims, has said "We essentially don't have a single photograph, a single piece of evidence that we can show to a jury". In June 2016, a federal judge dismissed the last claims in the lawsuit. In a separate lawsuit in state court, Cinemark was sued by families of the victims, who alleged the theater should have taken greater measures to prevent the such a shooting. In May 2016, after years of legal debate, a jury took three hours to deliver a unanimous verdict that the theater chain was not liable to any degree for the tragedy that transpired. The judge allowed Cinemark Theatres to submit a bill of costs to the plaintiffs to recover expenses due to the litigation, as Colorado state law allows for prevailing parties. In September 2016, Cinemark dropped all claims for reimbursement of legal fees. On January 14, 2013, Chantel Blunk, widow of victim Jonathan Blunk, filed a lawsuit against the University of Colorado in federal court. She alleged that a school psychiatrist could have prevented the slaughter by having Holmes detained after he admitted he "fantasized about killing a lot of people." This type of lawsuit had been anticipated in an August 2012 article co-authored by bioethicist Arthur Caplan which discussed the applicability of the landmark California Supreme Court decision in Tarasoff v. Regents of the University of California (1976) to the facts of the Aurora shooting. A grassroots community center, Aurora Strong Resilence Center, was established by community leaders, elected officials, and mental health professionals, as a response to the shooting. The center offers therapy for people who experienced traumatic stress from the theater shooting, and also people who were victims of other crimes and refugees who experienced a traumatic event in their country of origin before coming to the U.S. In the days following the attack, several people around the U.S. were arrested for threats and suspicious activities at or near screenings of The Dark Knight Rises. On July 22 in Norwalk, California, a man at a The Dark Knight Rises screening who yelled, "Does anyone have a gun?" and "I should go off like in Colorado." was arrested for making criminal threats. He served three months in jail and was sentenced to three years on probation. On July 22 in Pittsburgh, Pennsylvania, a man faced criminal charges for being involved in a fight in a cinema restroom. During the fight, a moviegoer shouted "Gun! ", causing panic inside the theater showing The Dark Knight Rises. On July 23 in San Jose, California, someone threw a package into a theater showing The Dark Knight Rises and reportedly yelled that it was a bomb, leading to an evacuation. On July 23 in Sierra Vista, Arizona, a moviegoer's confrontation with an intoxicated man with a backpack at a The Dark Knight Rises screening led to "mass hysteria" and 50 people evacuating the theater. On August 4 in Westlake, Ohio, a man was arrested for carrying several weapons in a satchel into a screening of The Dark Knight Rises. The suspect later received six months imprisonment over the incident. Colorado gun sales spiked after the shooting, with the number of background checks for people seeking to purchase a firearm in the state increasing to 2,887, up 43% from the previous week. Gun sales in Washington, Florida, California, and Georgia also increased. The shooting reignited the political debate on gun control, with one issue being the "easy access" Holmes had to semi-automatic rifles and high-capacity magazines, which were banned federally from 1994 to 2004. The results of a survey released on July 30, 2012 by the Pew Research Center suggested the incident did not change Americans' views on the issue. In 2015, a campaign titled "No Notoriety" was started by the parents of Alexander Teves, who died in the shooting. According to Teves' father, the campaign's incentive is to encourage media outlets to limit the usage of the suspect's name and photos when reporting about the Aurora shooting, as well as other mass shootings that receive national media coverage. In an interview on CNN, Teves' parents said they and the relatives of other victims believe the mass media coverage of Holmes' name and photo may inspire others to commit mass shootings for notoriety. A memorial to the victims of the attack was installed near Aurora Municipal Center, just over half a mile from the theater, and dedicated on July 19, 2018, one day before the sixth anniversary of the attack. It consists of a park-like dell with 83 abstract birds, one for each victim. Thirteen of the birds, with translucent wings, are on a center column and represent the twelve dead and the unborn child. The memorial, titled "Ascentiate," was designed by artist Douwe Blumberg. ^ Wade, Diane A. (July 23, 2012). "James Holmes appears in court being accused of killing 12 people in Aurora cinema shooting". BelleNews. Retrieved August 8, 2012. ^ a b c "Officials release complete list of injured victims in Aurora massacre". Fox News Channel. January 10, 2013. Retrieved July 4, 2013. ^ Woodruff, Judy (April 27, 2015). "Colo. shooting DA says two evaluations found Holmes sane". PBS NewsHour. Retrieved July 31, 2015. ^ O'Neill, Ann (August 26, 2015). "Theater shooter Holmes gets 12 life sentences, plus 3,318 years". CNN. Retrieved August 26, 2015. ^ a b Brown, Jennifer (July 21, 2012). "12 shot dead, 58 wounded in Aurora movie theater during Batman premier". The Denver Post. Retrieved July 21, 2012. ^ Parker, Ryan; Lee, Kurtis; Ingold, John; Steffen, Jordan; Brown, Jennifer (July 20, 2012). "Family identifies 27-year-old victim of Aurora theater shooting". The Denver Post. Archived from the original on July 23, 2012. Retrieved July 20, 2012. ^ Asmar, Melanie (January 10, 2013). "James Holmes: Read timeline of his actions before and after Aurora theater shooting". Blogs.westword.com. Retrieved March 1, 2014. ^ Ingold, John; Steffen, Jordan (April 25, 2015). "Long awaited trial begins for Aurora movie theater shooting defendant". The Denver Post. Retrieved April 25, 2015. ^ Carter, Chelsea J.; Pearson, Michael (July 20, 2012). "Gunman turns 'Batman' screening into real-life 'horror film'". CNN. Retrieved July 20, 2012. 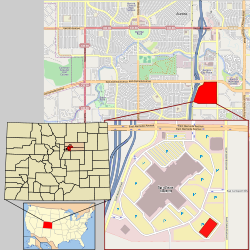 ^ a b "Aurora, Colo theater shooting timeline, facts". KABC-TV. July 22, 2012. Retrieved July 22, 2012. ^ Bustillo, Miguel; Banjo, Shelly; Audi, Tamara (July 21, 2012). "Theater Rampage Jolts Nation". The Wall Street Journal. Retrieved July 23, 2012. ^ a b Burnett, Sara; Fender, Jessica (July 20, 2012). "Aurora shooting suspect left apartment "booby trapped," music blaring". The Denver Post. Retrieved July 23, 2012. ^ Raquel Villanueva and Associated Press, news source (April 26, 2015). "Aurora theater shooting trial adjourns for day". 9News. Archived from the original on April 28, 2015. Retrieved February 7, 2017. ^ Muskal, Michael (July 20, 2012). "Questions, but few answers, in Colorado shooting; 12 dead, dozens hurt". Los Angeles Times. Retrieved July 20, 2012. ^ a b Pilkington, Ed; Williams, Matt (July 20, 2012). "Colorado theater shooting: 12 shot dead during The Dark Knight Rises screening". The Guardian. London. Retrieved July 20, 2012. ^ "Aurora Police Chief Dan Oates on Movie Shooting". Channel 7 – Denver. July 20, 2012. Retrieved July 25, 2012. ^ a b "Rifle failure that stopped yet more batman carnage". Daily Express. July 23, 2012. Retrieved July 23, 2012. ^ a b "Paul Toohey Horror inside a heart of Darkness". The Advertiser. July 28, 2012. pp. 52–61. ^ Fahrenthold, David A. (July 22, 2012). "Colorado shooting spree could have been worse; shooter's gun jammed, official says". The Washington Post. Retrieved July 22, 2012. ^ "Police: Suspect wore body armor, used assault rifle, shotgun, Glock handgun in theater attack". CBS News. Associated Press. July 20, 2012. Archived from the original on July 22, 2012. Retrieved July 20, 2012. ^ "Batman premiere gunman looked like 'assassin ready for war'". CBC News. July 20, 2012. Retrieved July 20, 2012. ^ Kent, William (July 20, 2012). "Aurora witnesses describe shooter's entrance, chaos". CBS This Morning. Retrieved July 24, 2012. ^ Marshall, Jaime (July 20, 2012). "Witness stories from Aurora movie theater shooting". Coloradoan. Retrieved July 24, 2012. ^ Tenser, Phil. Aurora police testify in James Holmes' trial: 240 ballistic impacts found after theater shooting, KJRH, May 14, 2015. ^ a b Horwitz, Sari (July 20, 2012). "Police say Colorado shooting suspect James Holmes had 2 pistols, assault rifle, shotgun". The Washington Post. Retrieved July 20, 2012. ^ Kane, Arthur; Ferrugia, John (July 21, 2012). "Sources: Shooter Took Prescription Drug Before Attack". ABC News 7 Denver. Retrieved July 23, 2012. ^ Ingold, John (October 16, 2013). "Aurora police sergeant describes lifesaving theater-shooting decision". The Denver Post. Retrieved October 16, 2013. ^ a b "Colorado police officer says movie theater gunman was 'very calm'". Yahoo! News. April 30, 2015. Retrieved April 30, 2015. ^ "New details emerge in hearing for Colorado theater shooting suspect". CNN. January 8, 2013. Retrieved March 1, 2014. ^ "Aurora 'Dark Knight' Suspect James Holmes Says He 'Was the Joker': Cops". ABC News. Retrieved July 21, 2012. ^ "James Holmes claimed to be the Joker, NYPD Commish says". Newsday. Associated Press. July 20, 2012. Retrieved February 23, 2013. ^ "James Holmes makes court appearance in Colorado theater shooting". Los Angeles Times. July 23, 2012. Archived from the original on July 30, 2012. Retrieved August 21, 2012. ^ Pearce, Matt (July 22, 2012). "Gun's magazine shaped the pace of Colorado theater massacre". Los Angeles Times. Retrieved July 23, 2012. ^ Gurman, Sadie (June 1, 2015). "On video, theater gunman says killings got him 'value units'". Yahoo News. Retrieved June 1, 2015. ^ Lysiak, Matthew; Arkin, James; Mcshane, Larry (July 21, 2012). "Aurora shooting suspect James Holmes jailed in solitary: 'All the inmates were talking about killing him'". Daily News. New York. Retrieved July 22, 2012. ^ Gabbatt, Adam (July 20, 2012). "Aurora shooting: 12 dead as gunman opens fire at movie theater: as it happened". The Guardian. London. Retrieved July 20, 2012. ^ "Colo. shooting suspect James Holmes' apartment booby trapped, police say". CBS News. Associated Press. July 20, 2012. Retrieved July 20, 2012. ^ Holden, Will C. (July 20, 2012). "Slideshow: Aurora theater shooting scene, suspect's booby-trapped apartment". KDVR (Fox 31 Denver). Retrieved July 20, 2012. ^ Sandell, Clayton; Dolak, Kevin; Curry, Colleen (July 20, 2012). "Colorado Movie Theater Shooting: Suspect Bought 4 Guns, 6,000 Rounds of Ammunition in Past 60 Days". ABC News. Retrieved July 20, 2012. ^ Eligon, John; Santora, Mark (July 21, 2012). "Police at Home of Colorado Suspect Disarm Major Threats". The New York Times. Retrieved July 25, 2012. ^ Harlow, Poppy; Payne, Ed (July 24, 2012). "Official: Trap in Colorado suspect's home had 30 homemade grenades, gasoline". CNN. Retrieved July 25, 2012. ^ Paulson, Steven K. "Detonation and fire possible at Colo. apartment". MSNBC. Retrieved July 21, 2012. ^ "Massacre suspect's neighbor: 'I'm counting my lucky stars'". CNN. July 22, 2012. Retrieved July 21, 2012. ^ "Loud Music Used To Lure People to Booby-Trapped Apt". TheDenverChannel.com. July 20, 2012. Retrieved July 21, 2012. ^ Johnson, M. Alex (July 23, 2012). "Theater massacre suspect appears in Colorado courtroom". NBC News. Archived from the original on July 6, 2017. Retrieved July 23, 2012. ^ Flaccus, Gillian; Riccardi, Nicholas (July 23, 2012). "Movie massacre suspect mum; Batman mask found". Yahoo News. Retrieved July 23, 2012. ^ "Photos: Residents allowed back into building where alleged shooter lived". The Denver Post. Retrieved July 26, 2012. ^ Sandell, Clayton; Dolak, Kevin; Curry, Colleen (July 20, 2012). "Colorado Movie Theater Shooting: 70 Victims the Largest Mass Shooting". Good Morning America. Retrieved July 21, 2012. ^ "Colorado Massacre Could Have Been Worse". CBS News. ^ "Obama offers condolences, community grieves in vigil for DKR shooting victims". KPTV. ^ "50 dead, Islamic terrorism tie eyed in Orlando gay bar shooting". www.cbsnews.com. Retrieved June 12, 2016. ^ Welsh, Teresa (July 20, 2012). "Should the Colorado Theater Shooting Spur More Gun Control?". US News and World Report. Retrieved July 30, 2012. ^ "Aurora heroes: Three who gave their lives". CNN. July 29, 2012. ^ "Colorado shooting survivor tells how Crystal Lake boyfriend John Larimer shielded her before he died". Chicago Tribune. July 24, 2012. ^ PELZER, JEREMY. "Gordon Cowden's last words of love remembered during first service for Colorado theater shooting victims - NY Daily News". nydailynews.com. Retrieved July 21, 2018. ^ Peipert, Thomas. "A look at the Lives of Colorado shooting victims". Brandenton Herald. Archived from the original on July 26, 2012. Retrieved July 23, 2012. ^ "People of the State of Colorado v. James Eagan Holmes" (PDF). State of Colorado Judicial Department. 2013. Retrieved May 21, 2015. ^ Petchesky, Barry (July 20, 2012). "Why Jessica Ghawi Wrote Under The Name Redfield: Moving Stories From The Shooting Victim's Colleagues". Deadspin. Retrieved February 10, 2016. ^ Auerbach, Nicole (July 15, 2013). "Remembering aspiring sports journalist a year after Aurora shooting". USA Today. Retrieved February 10, 2016. ^ Dark Knight Rises Shooting Victim Jessica Ghawi Remembered for Enthusiasm, Sense of Humor, People, July 20, 2012. ^ "James Holmes murder trial includes gruesome evidence, tears". Los Angeles Times. June 1, 2015. Retrieved June 1, 2015. ^ "Hospital bills forgiven for Colorado shooting victims". The Christian Science Monitor. July 25, 2012. Retrieved September 13, 2012. ^ "Woman who lost everything caps prosecution in Holmes trial". CBS News. June 19, 2015. Retrieved June 19, 2015. ^ "Comedy helps pull Caleb Medley through tragedy of Aurora shootings". The Denver Post. July 19, 2014. ^ La Ganga, Maria L. (July 16, 2015). "James Holmes guilty of murder in Colorado theater massacre; jury to weigh death penalty". The Los Angeles Times. Retrieved July 17, 2015. ^ "Shooting Victims Gain Veto Power in Donation Distribution". The Denver Channel. August 31, 2012. Retrieved September 13, 2012. ^ Draper, Electa (September 13, 2012). "Aurora movie theater shooting victims to respond to surveys". The Denver Post. Retrieved September 13, 2012. ^ Draper, Electa (November 16, 2012). "Theater shooting: Payments from Aurora victim fund set, families of the dead get $220,000". The Denver Post. Retrieved November 17, 2012. ^ "James Holmes appears 'dazed' in court", CBS News, July 23, 2012, Quote: "During his first court appearance on Monday, the 24-year-old frequently closed his eyes and appeared sleepy or dazed before the judge." ^ Alex Brandon (AP), "Again appearing dazed in court, Holmes charged| Prosecutors and defense attorneys spar over whether a notebook that he reportedly sent to a psychiatrist is privileged information", Dubuque Telegraph Herald, July 31, 2012, Quote: "James Holmes appeared just as dazed as he did in his first court hearing after the deadly Colorado movie theater massacre." ^ Riccardi, Nicholas; Banda, P. Solomon (July 30, 2012). "Colo. Suspect Charges: Murder, Attempted Murder". ABC News. Retrieved July 31, 2012. ^ Winter, Jane (July 30, 2012). "Colorado movie massacre suspect to be formally charged". Fox News Channel. Retrieved July 30, 2012. ^ Banda, Solomon (August 9, 2012). "Lawyers: Colo. Shooting Suspect is Mentally ill". ABC News. Associated Press. Retrieved August 9, 2012. ^ "Prosecutors: Colo. suspect James Holmes made threat in March". USA Today. August 24, 2012. Retrieved August 24, 2012. ^ "Aurora prosecutors drop fight for James Holmes' notebook". The Guardian. London. Associated Press. September 20, 2012. Retrieved September 22, 2012. ^ Ingold, John (January 7, 2013). "Aurora theater shooting: Cops took pill bottles from Holmes' apartment". The Denver Post. ^ "Aurora cinema massacre suspect James Holmes offers to plead guilty". The Guardian. London. March 28, 2013. ^ "James Holmes prosecutors seek death penalty against Aurora suspect". The Guardian. London. April 1, 2013. Retrieved April 1, 2013. ^ Ingold, John (June 4, 2013). "Judge allows evidence from James Holmes' iPhone, e-mails at trial". The Denver Post. Retrieved March 2, 2014. ^ "Judge considering another James Holmes trial delay". Fox News Channel. ^ a b "Details emerge about jury picked for Colorado theater shooting trial". Yahoo! News. April 15, 2015. Retrieved April 15, 2015. ^ Coffman, Keith. Colorado movie gunman not faking psychosis, defense witness says, Yahoo News, June 2, 2015. ^ Gurman, Sadie (May 7, 2015). "Facts, emotions take turn at Colorado theater shooting trial". Yahoo! News. Associated Press. ^ "Aurora theater trial jurors see James Holmes' evidence". Aurora Sentinel. Associated Press. May 8, 2015. ^ Tenser, Phil. "Aurora movie theater shooting: Attorneys who'll be trying to prove James Holmes' guilt or innocence". ABC 7. Archived from the original on July 23, 2015. Retrieved July 23, 2015. ^ "Aurora theater shooting notebook details aired for first time". KDVR. May 26, 2015. ^ "James Holmes' notebook read to jury in Colorado movie massacre trial". CNN. May 26, 2016. ^ "Psychiatrist: Colorado shooter knew what he was doing". SFGate. Associated Press. May 28, 2015. Archived from the original on May 28, 2015. Retrieved May 29, 2015. ^ Coffman, Keith (June 8, 2015). "Second psychiatrist concludes Colorado cinema gunman was sane". Reuters. Retrieved June 8, 2015. ^ "Judge in Colorado theater shooting trial dismisses 3rd juror". Yahoo! News. June 9, 2015. Retrieved June 9, 2015. ^ "Theater shooter's ex asked him to see therapist". Yahoo! News. June 11, 2015. Retrieved June 11, 2015. ^ Coffman, Keith (June 17, 2015). "Judge dismisses fifth juror in Colorado movie theater shooting trial". Yahoo! News. Retrieved June 17, 2015. ^ Verccamen, Paul; Almasy, Steve (July 9, 2015). "Movie theater gunman says he will not testify". CNN. Retrieved July 18, 2015. ^ Elliott, Dan (July 10, 2015). "Defense in Colorado theater shooting trial rests its case". Yahoo! News. Retrieved July 10, 2015. ^ "James Holmes Found Guilty of First-Degree Murder in Colorado Theater Mass Shooting, Shows No Reaction". KTLA-TV. July 16, 2015. Retrieved July 16, 2015. ^ Steffen, Jordan (July 16, 2015). "James Holmes guilty of murder in Aurora theater shooting". Denver Post. Retrieved December 28, 2018. ^ Villanueva, Raquel (July 17, 2015). "Sentencing phase to start next week". 9News. Archived from the original on July 16, 2015. Retrieved July 17, 2015. ^ Coffman, Keith; Wallis, Daniel (July 22, 2015). "Colorado death penalty in focus as massacre trial enters new phase". Yahoo! News. Retrieved July 22, 2015. ^ LaGanga, Maria L. (July 23, 2015). "James Holmes jury find aggravating factors exist, moves on to second phase". Los Angeles Times. Retrieved July 23, 2015. ^ "Father of Colorado movie gunman pleads with jury for his life". Yahoo! News. July 28, 2015. Retrieved July 29, 2015. ^ Gurman, Sadie (July 30, 2015). "James Holmes Defense Make Final Appeal For Mercy". The Huffington Post. Retrieved July 31, 2015. ^ "James Holmes moves closer to death penalty verdict". BBC News. August 3, 2015. Retrieved August 3, 2015. ^ Calamur, Krishnadev (August 3, 2015). "Why James Holmes Is a Step Closer to Facing the Death Penalty". The Atlantic. Retrieved August 4, 2015. ^ Sickles, Jason (August 7, 2015). "Theater shooting verdict: James Holmes sentenced to life in prison". Yahoo! News. Retrieved August 7, 2015. ^ "James Holmes sentenced to life in prison in the Aurora theater shooting". The Denver Post. August 7, 2015. Retrieved August 7, 2015. ^ Fieldstadt, Elisha; Rascon, Jason (August 7, 2015). "Aurora movie theater shooter James Holmes to be sentenced to life in prison". NBC News. Retrieved August 7, 2015. ^ Gurman, Sadie (August 25, 2015). "WATCH LIVE: Day 2 in the sentencing of Aurora theater shooting gunman". The Gazette. Associated Press. Retrieved August 26, 2015. ^ Blond, Becka (July 21, 2012). "Tearful Vigils Remember Victims of Aurora Massacre". Chicago Tribune. Archived from the original on January 2, 2013. Retrieved July 21, 2012. ^ Wing, Nick (July 20, 2012). "Obama Colorado Shooting Proclamation: Flags To Be Flown at Half Staff for Victims". The Huffington Post. Retrieved July 20, 2012. ^ Weiner, Rachel (July 20, 2012). "Obama, Romney pull Colorado ads off air in wake of Aurora shooting". The Washington Post. Retrieved July 20, 2012. ^ Nakamura, David (July 20, 2012). "Obama, Romney express condolences for Colorado shooting victims". The Washington Post. Retrieved July 20, 2012. ^ "Aurora shooting: Obama says all US stands with victim". BBC News. July 23, 2012. Retrieved July 23, 2012. ^ Fords, Dana (July 23, 2012). "'Words Are ... Inadequate,' Obama Tells Families of Colorado Shooting Victims". CNN. Retrieved July 23, 2012. ^ Eligon, John; Kovaleski, Serge F.; Santora, Marc (July 22, 2012). "Obama Consoles Aurora as City Begins Healing". The New York Times. Retrieved July 23, 2012. ^ McNakamura, David (July 23, 2012). "After Aurora shootings, Obama Again Takes on Role as Healer in Chief in Colorado". The Washington Post. Retrieved July 23, 2012. ^ Marschall, Rick (July 23, 2012). "President Barack Obama Visits Aurora Victims' Families and Survivors". continentalnews.net. Archived from the original on August 1, 2012. Retrieved July 23, 2012. ^ "Message of condolence following recent tragic events in the USA, 20 July 2012". royal.gov.uk. Archived from the original on July 22, 2012. Retrieved July 26, 2012. ^ "Communiqué – Fusillade dans un cinéma américain" (in French). elysee.fr. Archived from the original on July 23, 2012. Retrieved July 26, 2012. ^ "PM Netanyahu Sends Condolence Letter to US President Barack Obama Following the Massacre in Aurora, Colorado". pmo.gov.il. Retrieved July 26, 2012. ^ "Condolences to US President Barack Obama". kremlin.ru. Retrieved July 26, 2012. ^ "Pope Promises Prayers for Denver Victims". zenit.org. July 23, 2012. Archived from the original on April 16, 2013. Retrieved July 26, 2012. ^ Finn, Natalie (July 21, 2012). "Dark Knight Rises Director Christopher Nolan Breaks Silence on 'Unbearably Savage' Colorado Shooting". E! News. Retrieved July 21, 2012. ^ Leffler, Rebecca (July 20, 2012). "'Dark Knight Rises' Paris Premiere Scrapped Following U.S. Shootings". The Hollywood Reporter. NBC News. Retrieved July 20, 2012. ^ "Batman film Marketing Campaign Scaled Down in Finland". Yle Uutiset. July 20, 2012. Retrieved July 23, 2012. ^ Blencowe, Annette (July 20, 2012). "Batman-elokuvan nettikampanja keskeytettiin Suomessa" [Batman movie online campaign was suspended in Finland] (in Finnish). yle.fi. Retrieved July 20, 2012. ^ "In Wake of Shooting, 'The Dark Knight Rises' Won't Report Early Box Office Figures". The Wall Street Journal. July 21, 2012. Retrieved July 21, 2012. ^ White, Michael; Palmeri, Christopher; Lee, Edmund (July 20, 2012). "Warner Bros. Said to Pull Some TV Ads for 'Dark Knight'". Bloomberg BusinessWeek. Bloomberg. Retrieved July 20, 2012. ^ Belloni, Matthew (July 23, 2012). "Warner Bros. To Make 'Substantial' Donation to Colorado Shooting Victims". The Hollywood Reporter. Retrieved July 24, 2012. ^ Morley, Will (July 20, 2012). "Christopher Nolan on Theater Shooting: 'I Would Like to Express Our Profound Sorrow'". Entertainment Weekly. Retrieved July 21, 2012. ^ Townsend, Mark. "Colorado Rockies pay visit to Aurora shooting survivors and hospital staff". Yahoo! Sports. Retrieved July 27, 2012. ^ "Broncos visit with shooting survivors". ESPN. Associated Press. July 23, 2012. Retrieved November 3, 2013. ^ Macatee, Rebecca. "Gangster Squad Trailer Yanked from Internet, Dark Knight Rises Following Colorado Shooting". Retrieved July 21, 2012. ^ Bindley, Katherine (July 20, 2012). "'Gangster Squad' Trailer with Theater Shooting Scene Pulled from 'Dark Knight' by Warner Bros. (UPDATED)". The Huffington Post. Retrieved July 20, 2012. ^ Finke, Nikki. "Warner Bros Pulls Trailer of Gangster Shooting Up Movie Theater". Deadline Hollywood. Retrieved July 20, 2012. ^ Strauss, Bob (January 20, 2013). "Out of respect for grieving families, "Gangster Squad" scene refilmed after Aurora theater shootings". The Denver Post. Retrieved January 29, 2013. ^ "BATMAN INC No. 3 Delayed By DC Following Aurora Shooting". Blog.newsarama.com. July 24, 2012. Retrieved August 10, 2012. ^ "Batman Comic Postponed Because It Features A Teacher Pointing Gun at Students". PerezHilton.com. July 27, 2012. Retrieved August 10, 2012. ^ Wallenstein, Andrew (July 27, 2012). "Warner Bros. tones down 'Batman' TV toon". Variety. Retrieved August 10, 2012. ^ "'Dark Knight Rises' Composer Dedicates New Song To Aurora Victims". MTV. July 27, 2012. Retrieved July 27, 2012. ^ "Hans Zimmer composes song for Aurora victims". Yahoo! News. Associated Press. July 27, 2012. ^ "'Batman' Movie Massacre – Theater Steps Up for Victims' Funeral Expenses". FM News Weekly. Retrieved July 28, 2012. ^ Lee, Kurtis (January 17, 2013). "Century Aurora theater reopens with ceremony, showing of "The Hobbit"". The Denver Post. Retrieved January 22, 2013. ^ Ingold, John (April 2, 2015). "Aurora theater shooting suits against Cinemark set for July 2016 trial". The Denver Post. Retrieved July 2, 2015. ^ "Security Stepped Up Nationwide in Wake of Colorado Movie Theater Shooting". CNN. July 21, 2012. Retrieved July 23, 2012. ^ Siegel, Elyse (July 20, 2012). "Colorado Shooting 2012: Witness Says Gunman Shot Anyone Trying To Leave". The Huffington Post. Retrieved July 20, 2012. ^ Lee, Edmund (July 20, 2012). "Cinema Security Tightened After 'Dark Knight' Shootings". Bloomberg L.P. Retrieved July 25, 2012. ^ McKay, Hollie (July 20, 2012). "National theater association reviewing all security procedures in wake of Colorado midnight movie massacre". Fox News Channel. Retrieved July 25, 2012. ^ "Security Recommendations Sent To Theater Owners". Hartford Courant. July 20, 2012. Retrieved July 25, 2012. ^ West, Kelly (July 20, 2012). "AMC Bans Masks And Fake Weapons at Their Theaters in the Wake of the Aurora Shooting". Bloomberg L.P. Retrieved July 25, 2012. ^ Richardson, Whit (July 23, 2012). "Reassessing cinema security in the wake of Colorado's movie theater massacre". Security Director News. Archived from the original on July 29, 2012. Retrieved July 25, 2012. ^ Ingold, John (September 21, 2012). "Aurora theater shooting victims file suits against Cinemark". The Denver Post. Retrieved October 11, 2012. ^ Walsh, Michael (September 22, 2012). "'Dark Knight' shooting spree victims bring civil lawsuit in Colorado against Aurora theater for lack of security". Daily News. New York. ^ Motion to Dismiss, Nowlan v. Cinemark USA, Inc. et al., Civil Action No. 1:12-cv-02517-RBJ-MEH, U.S. Dist. Ct., D. Colo., September 27, 2012, Deadline.com, last visited October 11, 2012. ^ Lopez v. McDonald's Corp., 193 Cal. App. 3d 495 (1987). ^ "Colorado judge denies theater rampage victims access to criminal files". Reuters. October 31, 2012. Retrieved October 31, 2012. ^ Ingold, John (October 30, 2012). "Aurora theater shooting judge denies victims' bid for records". The Denver Post. Retrieved December 15, 2012. ^ John Ingold, "Judge says wrongful death claims in theater shootings should be tossed," The Denver Post, January 25, 2013. ^ Patten, Dominic (August 17, 2014). "Cinemark Again Denied Attempt To Toss Colorado Theater Shooting Lawsuits". Deadline. Retrieved July 3, 2015. ^ "Cinemark Beats Victims' Lawsuit Over Mass Shooting at Colorado Movie Theater". Hollywood Reporter. June 27, 2016. Retrieved September 6, 2018. ^ "Cinemark Not Liable in Colorado Theater Shooting, Jury Finds". Variety. May 19, 2016. Retrieved September 6, 2018. ^ "First suit filed against University of Colorado in Aurora shooting". NBC News. Retrieved January 16, 2013. ^ Caplan, Arthur; Sisti, Dominic (August 3, 2012). "What should a doctor do with a patient like James Holmes". Philadelphia Inquirer. Archived from the original on December 14, 2012. ^ "Aurora Strong Resilience Center". Denver Foundation. ^ "Colorado Shooting-Mental Health Story". Yahoo! News. Associated Press. April 24, 2015. ^ Dillon, Nancy (July 24, 2012). "Arrest at 'Dark Knight Rising' in California". Daily News. New York. Retrieved August 20, 2012. ^ Man sentenced for making threats during 'Dark Knight' screening at Norwalk theater, Cerritos-Artesia Patch.com, September 13, 2012. Retrieved April 23, 2015. ^ Nordyke, Kimberly (July 23, 2012). "Man Charged After Fight Forces Evacuation at 'Dark Knight Rises' Screening". The Hollywood Reporter. Retrieved August 20, 2012. ^ "San Jose: Package thrown into 'Dark Knight' showing prompts Eastridge theaters evacuation". Oakland Tribune. July 24, 2012. Retrieved September 22, 2012. ^ "Michael Borboa Arrested At 'The Dark Knight Rises' Screening in Arizona". The Huffington Post. July 24, 2012. Retrieved August 20, 2012. ^ Bierly, Mandi. "Heavily armed man arrested at 'Dark Knight Rises' screening in Ohio". Entertainment Weekly. Retrieved August 10, 2012. ^ Switaj, Lori E.; Lea, Jason (March 31, 2013). "'Dark Knight' Suspect Gets 6 Months". Westlake.patch.com. Retrieved April 1, 2013. ^ Burnett, Sara (July 23, 2012). "Aurora theater shooting: Gun sales up since tragedy". The Denver Post. Retrieved July 24, 2012. ^ "Gun sales surging in wake of 'Dark Knight Rises' shooting". New York Post. Associated Press. July 25, 2012. Retrieved August 7, 2012. ^ Baker, Mike; Wyatt, Kristen (July 25, 2012). "Fear prompts gun sales after Colorado theater massacre". Salt Lake City Tribune. Retrieved July 30, 2012. ^ Jervis, Rick; McAuliff, John (July 24, 2012). "Colo. rampage adds fuel to gun-control debate". USA Today. Retrieved July 30, 2012. ^ "Views on Gun Laws Unchanged After Aurora Shooting". Pew Research Center. July 30, 2012. Retrieved August 1, 2012. ^ Ingold, John (February 8, 2015). "As trial nears, debate grows over naming the Aurora theater shooting". The Denver Post. ^ "Victims' parents want "no notoriety" for mass shooters". CNN. January 25, 2015. ^ "Memorial to victims of Aurora theater shooting unveiled six years later". The Denver Post. July 19, 2018. "Aurora Colorado theater shooting: The Big Picture", The Boston Globe. July 23, 2012. Photos of the aftermath of the shooting and Holmes's booby-trapped flat Released by Arapahoe County District Attorney's Office on September 10, 2015.